The nightmare that is Guantanamo never seems to end. Even before President Donald Trump reversed an Obama Administration order to close the detention center at Guantanamo — an action never completed — the Pentagon issued a formal solicitation for material to construct a padded cell at the Cuba-based prison. 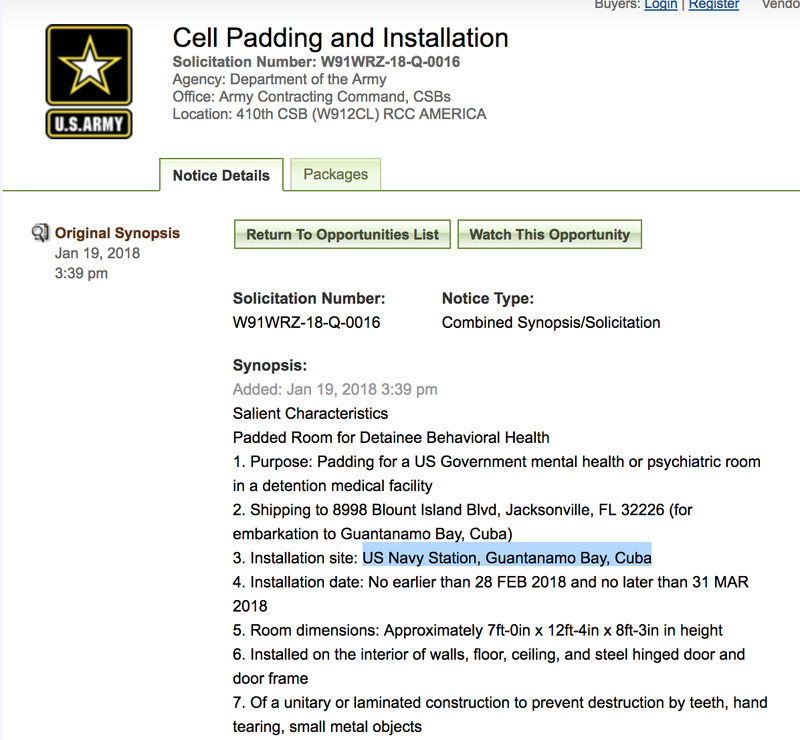 According to the Army’s announcement, the installation date for the padded cell will be sometime between February 28 and March 31, 2018. The material will ship to Guantanamo from the Blount Island Terminal in Jacksonville, Florida. The bid, which must have been made by January 29, was to also include labor for installation of the material in the cell itself. There have been numerous reports of mental illness at Guantanamo, including allegations of suicide. The autopsy for one detainee, Mohammed Al Hanashi, who in June 2009 supposedly strangled himself to death with a piece of his underwear, described multiple attempts to harm himself with head banging. Medical authorities noted that Al Hanashi’s mental illness was itself caused by the “conditions of confinement” at Guantanamo. Other detainees have been described as severely mentally ill at U.S. naval base-sited prison. In 2016, it was revealed that military authorities had hidden the fact that a key early torture victim, Mohammed Al Qahtani, had a lifetime history of mental illness. Many detainees have been apparently driven insane by the abusive conditions at Guantanamo. A June 2008 report by Human Rights Watch warned that the abusive conditions of confinement at Guantanamo, in particular the widespread use of solitary confinement, was precipitating significant mental illness in detainees, just as it does in America’s Supermax prisons. In my book, Cover-up at Guantanamo, in-depth descriptions, based on Freedom of Information Act documents, show what it was like to be in the psychiatric unit at Guantanamo. Prisoners were involuntarily drugged, their complaints of being tortured ignored by the medical professionals present. At least one prisoner died while being held in the supposedly safe confines of the Guantanamo Behavioral Health Unit (BHU). Another was found dead within 24 hours of release from the BHU. The solicitation for materials to build a new padded cell at Guantanamo is yet another indicator that the U.S. government has no intention of shutting down that facility. Indeed, it expects that it will drive even more prisoners insane. The construction of a padded cell could be interpreted as a humane gesture to protect seriously mentally ill prisoners intent on self-harm. Or it could be understood as yet another element of a wide-spread and deeply thought-out torture apparatus. The history of Guantanamo argues strongly for the latter. It is distressing to see how disturbingly easy it has been to bury the real purpose of Guantanamo, which was to create an experimental “battle lab” on interrogation and detention techniques, whose aim was to “break” the detainees held in U.S. custody, and to “exploit” them for purposes of information, propaganda, and intelligence purposes, e.g. to force them to work for U.S. government intelligence agencies. While the situation surrounding government torture incrementally improved under President Obama. But the UN Committee Against Torture announced in 2014 that the U.S. was still using torture techniques in its Army Field Manual on interrogations. Given this context, the moves by the Trump Administration to roll back even the gains made during the previous administration are disturbing. Guantanamo represents the final failure of the American dream. It is the antithesis of human liberty. Enhancing Guantanamo’s facilities is not in anyone’s interest, unless it be those who profit by its construction and maintenance. Trump’s executive order is not the last word on the fate of Guantánamo, any more than his attempted Muslim bans and arbitrary transgender military ban — struck down by the courts — were the last word on those matters. CCR has filed a new legal challenge to the illegality and racism driving Trump’s Guantánamo policy and demanding detainees’ release. It is the courts, not the authoritarian-in-chief, that will ultimately determine the fate of the men detained at Guantánamo.